A user-friendly guide by the authors of the classic bestsellers "What Your Doctor May Not Tell You About Menopause" and "What Your Doctor May Not Tell You About Premenopause", Dr. John Lee and Virginia Hopkins. This down-to-earth, easy-to-follow handbook gives women simple steps to find out if they have a hormone imbalance. Free of confusing medical terminology, yet filled with practical advice, "Hormone Balance Made Simple"gives clear, step-by-step guidance for a natural hormone program that's tailored to your individual needs. Now you can learn which hormones are right for you and how to deal with mood swings, hot flashes, night sweats, breast tenderness, irregular bleeding, and other distressing symptoms of menopause and premenopause. 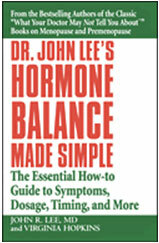 Click the button below to add the Hormone Balance Made Simple to your wish list.